It’s National School Breakfast Week! The Food Bank of Delaware will share best practices and special events from across the state of Delaware to highlight the importance of school breakfast! Picture the start of a school day, giggling students chat with friends, some shuffle papers and scramble to prepare for their first class, morning announcements play over the loudspeaker, teachers and administrators line the halls– in the midst of all of this commotion, school breakfast is served. One late bus or one jammed locker could make a difference in whether a child starts the day with a balanced breakfast or a rumbling stomach. For this reason, many schools are turning to “Breakfast after the Bell,” a collection of strategies to serve breakfast in a more convenient method for students. Grab n’ Go Breakfast: Students select breakfast items from the cafeteria or carts set up in the hallway, bag them up and head to their homeroom or first class to eat them. Students clear and wipe down their desks when finished, and custodial staff makes their rounds to collect trash from the classrooms. Breakfast in the Classroom: Teachers or staff members deliver and distribute meals to each classrooms during their morning classes. Custodial staff collects trash and the students clean up their desks. Second Chance Breakfast: Students are offered a nutrition break between first and 2nd period classes. Grab n’ Go Breakfast Carts or breakfast vending machines are available in the hallways. Staff makes sure trash cans are placed conveniently throughout the halls for easy disposal of waste. Recent studies by the Food Research & Action Center found that as schools move towards these more inclusive, alternative models of serving breakfast, the number of children consuming breakfast at school increases. Locally, advocates in Delaware take note of the benefits of breakfast, as well. Expanding school breakfast by offering these alternative serving models will provide students with additional opportunities to eat in the midst of the bustling school day mornings. Delaware schools celebrated the highest increase in school breakfast participation in the nation throughout the 2013/2014 school year, largely due to the adoption of “Breakfast after the Bell” programs in many districts. As a coalition of educators and community supporters, we can keep this momentum going to safeguard children’s nutrition and wellbeing. Spread the word to urge school administrators to champion this important cause. 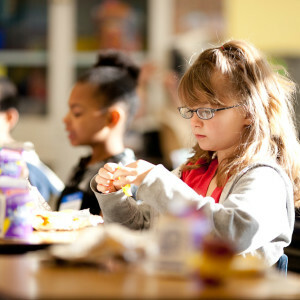 Educating school districts about the benefits of implementing “Breakfast after the Bell” could make the difference in whether or not a student gets access to a balanced meal to start their day. The Food Bank of Delaware is here to help! Want more information about expanding school breakfast in your school? Check out our resources page: http://www.fbd.org/school-breakfast-resources/.